Corporate Manslaughter Bill of 2018, the Provision of Section 39 which presumes an individual innocent until proven guilty in a competent Court of Law is contravened by the Bill, and it may be useful for the Bill to cover penalties to be imposed for the specific offenses. He Also wished to communicate his decision to Decline Presidential Assent to the Agricultural Credit Guarantee Skill Fund Amendment Bill of 2018, the amount proposed in the the Fund size will not be effective due to the fact that it retains the original fund size. Furthermore to decline President Assent to the N.C.P.E.A (Child Protection and Empowerment) Amendment Bill 2018 due to the fact that the proposed roles are being carried out by the Ministry of Women Affairs. Finally He Also declined Assent to the Courts and Tribunals Standard Scale of Fines Bill of 2017 as the proposed fines seem to be ambiguous and does not specify scales of offenses and fines as the Naira has a dynamic characteristic and hence the fixed scale may later not be practical. Hon. Adamu Shekarau brought the Petition on the Unfair treatment of a group of his constituents by the I.C.P.C, who without fair Hearing had their business accounts closed down. They begged the House for Legislative intervention. Hon. Ahmed Abu brought a Petition from an individual who is protesting the non-payment of $3 Million which was legally transferred to his bank account. Hon. Aminu Shagari Moved the Motion bothering on the attack of a village in Sokoto State by Armed bandits who maimed and injured scores of people. The bandits had communicated a threat to the villagers to pay a huge sum of money or risk attack. He lamented the failure of the Government in its primary role of securing the safety of life and properties of Nigerian citizens. Hon. Abdussamad Dasuki stated that the 8th House has Debated 79 Motions of insecurity and still no serious security measure has been put in place to secure scores of innocent lives. He called for the collective unity of Nigerians against terrorism as the security apparatus seems to have failed Nigerians. Hon. Tahir Monguno stated that it is sad that while the Northeast have begun enjoying relative peace, violence has started rearing its head in hitherto peaceful regions. He advised for the engagement of the youth in tackling armed bandits as it helped those from the Northeast. Hon. Yakubu Barde stated that history would judge the Legislature harshly if it sits, folds its hands and fails to cry out against the failure of the security Agencies. The Speaker of the House, Rt. Hon. 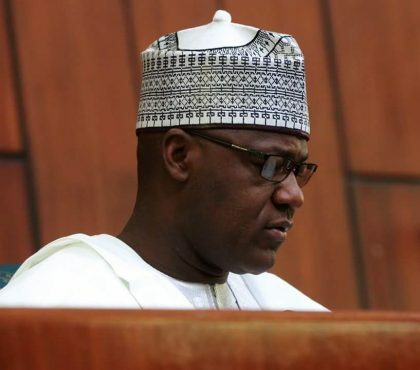 Yakubu Dogara in cooling down the tensive mood of the debate stated that as leaders; it is right Members listen to both pleasant and unpleasant things even in criticism, Hon. Ahmed Baba lamented the low number of security operatives saddled with the responsibility to secure the lives of teeming Nigerians. Hon. Nnenna Ukeje in reeling out the statistics of mayhem nationwide pointed out the indices which show that Nigeria is exhibiting the features of a nation at war, and is being invaded by forces who are unknown. She charged the Speaker to go to the President and let him know that Nigerians can no longer sit and be patient while they are being killed. Hon. Sunday Adepoju sated that if the P.D.P when in power were criticized for doing wrong, he as an A.P.C Member cannot in good conscience keep quiet when things have clearly gone wrong now that his Political Party is at the helm of affairs. Hon. Betty Apiafi reminded the House how it had passed a vote of no confidence on security chiefs, she she wondered why if civilians had to be mobilized to aid in the fight against terrorism, no change has been effected in the leadership or the mode of operations of the Security Agencies. She stated that the unpopular State Police may be the only practical and viable option for now. The Motion was Voted on and Passed. Hon. Tajudeen Yusuf Moved the Motion on the alleged invasion of the Government House of Eikiti State and spread of fear by men of the Nigeria Police in a bid to truncate the peaceful process leading to the upcoming Gubernatorial election. He pointed out that the Inspector General of Police would have been the best person to invite to explain the incident, he however has a track record of disregard for calls from the National Assembly. Hon. Gabriella Igbinedion lamented the lack of security prevalent in a political tool as fundamental and legal as a political rally. She feared for the scenario that may be played out during the 2019 general elections. Hon. Tahir Monguno called for the investigation of the true circumstances behind the incident as there seems to be too many versions of the line of events leading to the incident. Hon. Kingsley Chinda reminded the House that as Members of Parliament they should guard against any threat to democracy. He reminded Members that Political Parties have the right to campaign up to 24 hours before the election. Hon. Sunday Karimi stated that the Ekiti election is a test to the forthcoming elections and a mishandling of it is a premise to what may be obtainable in the forthcoming general elections in 2019. Hon. Aminu Suleiman stated that he does not believe the incident transpired the way the Governor of Ekiti State said it did. The Motion was Voted on and Passed. Nigerian Street Trading Regulation Commission (Establishment) Bill, 2018 (HB. 1517) (Hon. Linus Okorie) – First Reading. Federal College of Veterinary Assistants, Onicha (Establishment) Bill, 2018 (HB. 1518) (Hon. Linus Okorie) – First Reading. Federal College of Education (Technical), Ako, Ago-Iwoye, Ogun State (Establishment) Bill, 2018 (HB. 1519) (Hon. Adekoya Adesegun Abdel-Majid) – First Reading. Nigeria Para-Military Academy, Ijebu-Igbo (Establishment) Bill, 2018 (HB. 1520) (Hon. Adekoya Adesegun Abdel-Majid) – First Reading. Hon. Tahir Monguno Moved for the Third Reading of the Bill and it was Seconded by Hon. Orker Jev. It was voted on, Read the Third Time and Passed. A Bill For an Act to Establish the Dietitians Council of Nigeria to Regulate the Profession of Dietetics; and for Related Matters (HB.547) – Third Reading. A Bill for An Act to Establish the Federal Polytechnic, Kwale, Delta State to Provide Full-Time Courses in Technology, Applied Science, Management and other Fields of Studies and to Make Provisions for General Administration of the Polytechnic; and for Related Matters (HB.1492) (Hon. Ossai Nicholas Ossai) – Second Reading. A Bill for an Act to Establish the National Center for Child Development to, among other things, Advocate early Years Development, Promote Skills Acquisitions, Provide Assessment and Resources Centers, Drive Innovation, Design Developmental Programmes and activities for the Advancement of Children; and for Related Matters (HB. 1297) (Hon. Henry Ofongo) – Second Reading. It was Seconded by Hon. Raphael Igbokwe. In leading the debate Hon. Henry stated that the Center would ensure children are self reliant even without white collar employment, he also pointed out to children that drop out of school for various reasons before they complete their education. The Center if established would focus on children between the ages of 6-18 who require specialized skills for thriving despite the challenges of life. He pointed out that such a Center would also be beneficial to children orphaned from insurgency. It would also discourage forced child labor and manipulation and promote entrepreneurial skill acquisition. The Bill was Voted on, Passed for Second Reading and referred to the Committee on Women Affairs and Social Development. A Bill for an Act to Amend the Compulsory, Free, Universal Basic Education Act, Cap. C52, Laws of the Federation of Nigeria, 2004 to Increase the Block Grant of the Federal Government and reduce that of the States Governments; and for Related Matters (HB.1312) (Hon. Afe Olowookere) – Second Reading. Hon. Afe Moved for the Second Reading of the Bill and it was Seconded by Hon. Umar Jega. Hon. Afe stated that with the importance of education in the life of human beings, the application of free basic education should not be negotiated. The Bill seeks to Amend Section 11 of the Principal Act due to the fact that most States are unable to provide the required 50% counterpart funds, the Federal portion lies unused in the Central Bank. He sought for the reduction of the counterpart funding of States from 50% to 25%. It is said that only 2 States (Borno and Rivers) have been able to fully meet these requirements and duly enjoy the benefits of the scheme, this is indeed worrisome. Hon. Aishatu Dukku in supporting the Bill said the clamor has been on for a long time. She pointed out that the inability of States to access these funds is responsible for why so many children go to school in dilapidated structures. Hon. Tahir Monguno wondered why States who see education as a priority fail to pay up their counterpart funding when an insecurity-ravaged State like Borno can meet up? He asked for more commitment from States. The Bill was Voted on, Passed for Second Reading and Referred to the Committee on Basic Education and Services. Cerebrospinal Meningitis (Prevention, Control and Management) Bill, 2016 (HB.785) 29/11/2016. Discharge the Committees from the Bills and commit same to the Committee of the Whole for consideration. Hon. Bode Ayorinde Moved the Motion and it was Seconded by Hon. Azodo Eucharia. The Motion was Voted on and Passed. (ii) Mandate the Committee on Aviation to visit the Benin Airport to inspect and take an audit of the Airport Air Traffic Control Towers and report back within six (6) weeks for further legislative action. Hon. Omosede Moved the Motion and it was Seconded by Hon. Kayode Oladele. As an infrastructure related Motion it was Voted on and Passed. Set up an Ad-hoc Committee to investigate the usage and application of the CBN profits and audited accounts in the last 10 years, and report back within (4) weeks for further legislative actions. (iii) Also mandate the Committees on Legislative Compliance, and Banking and Currency to ensure strict compliance. (ii) Mandate the Committee on Police Affairs and the Ad-hoc Committee on the Review of the 1999 Constitution (as amended) to make provisions for a legislative framework for establishment of State Police in all States of the Federal Republic of Nigeria and report back within four (4) weeks for further legislative action. Hon. Rotimi Moved the Motion and it was Seconded by Hon. Raphael Igbokwe. In leading the debate Hon. Rotimi stated that security challenges in Nigeria have reached a critical stage apparent for all to see. As Legislators he sought the National Assembly to sponsor tools for the safeguard of the people they represent. He stated that even though the State Police is a controversial issue, yet an Amendment of the Constitution to allow State Police seems to be a very practical option. Hon. Edward Pwajok concurred to the consensus for the creation of State Police as the merits of the adoption of State Police far outweigh the perceived demerits. Hon. Bode Ayorinde stated that the Motion is a god one, but he still has reservations for the establishment of State Police as it would look like having 36 Presidents, he however advocated that the need seems to have arisen to enforce Community Policing for Officers of the lower cadre to go and work in their States of origin. Hon. Tahir Monguno also queried the issue of State Police from the angle of the additional burden on the States to pay the salaries of State Police. Hon. Omosede Igbinedion advised that stable and strong counter terrorism squads should be established and visible, they should have the double impact of assuring citizens of efforts being enforced to protect them and deter those who would want to cause further mayhem. The Motion was Voted on and Passed. Mandate the Committee on Health Care Services to ensure the realization of the project in Nigeria, and report back within four (4) weeks for further legislative action. ​A Bill for an Act to make Comprehensive Provisions for the Confiscation, Forfeiture and Management of Properties Derived from unlawful activities; and for Related Matters (HB. 872) (Hon. Kayode Oladele) – Committee of the Whole: 18/1/2017. The Bill was Deliberated on in the Seventh Assembly but the process was not completed. Due to the sensitivity of the Bill, the Eight House also picked interest and saw the need to ensure its complete passage. It looked critically at the proper definition and scope of application of Section 20 of the E.F.C.C Act and the I.C.P.C Act. It sought to propose strict compliance to human rights and to ensure non-wastage, but popper conversion of Lawfully determined assets for the economic advantage of the Nigerian State. The price of cement that was proposed to be pegged for affordability due to the large amount of bags utilized per building was then reviewed to fit the prevailing circumstances and to ensure practicability with current realities on ground. The House in Plenary Adopted the Voting of the House in the Committee of the Whole.